During the Nasscom annual strategy meeting held in Thimphu last week, Narayana Murthy, Infosys Chairman, announced that he would train 100 Bhutanese in his company. The offer is timely and, if used well, would be the first significant step towards creating the knowledge and skills base required to develop a viable ICT industry in Bhutan. A similar offer was made by Thaksin Shinawatra, Thailand’s PM, during his visit to Bhutan in June 2005. The visiting PM “…commended the Bhutanese’s versatility with the English language…” and publicly announced that he would be prepared to employ many Bhutanese as English teachers in Thailand. How many have been employed so far? Zero. Why? Because no one was given and no one took the lead to followed up with the Thai government. No one – not RCSC, not BCCI, not Foreign Ministry, not MOLHR – no one. So this time let’s not squander the opportunity. Let’s get serious. Let’s make full use of Mr Murthy’s offer. Let’s begin by signing an MOU between Infosys and the government. Then let’s start the selection process. At the least, Mr Murthy’s offer would be a welcome respite for our recent graduates, many of whom are concerned of looming unemployment. The offices of the Honourable MPs of the National Council were inaugurated yesterday. Their offices are now located on the second floor of the recently built Royal Banquet Hall. The second floor is actually the attic of the Royal Banquet Hall. But the offices are quite comfortable and the MPs, including the two who have no windows in their offices, are not complaining. Viewed from the outside the Royal Banquet Hall doesn’t look too bad. I was horrified when the original, historic banquet hall was razed to make way for this new building. And was initially appalled at how ugly the new structure looked while it was being built. Like I was saying, not too bad, but nothing like the quiet and charming original we’ve lost. By the way, the building was actually constructed as the National Council. At least, it appears that that was the plan and that’s what GOI, the main donor, was told. But that’s not the case, and now the beautiful main hall is used primarily to host banquets. Only the attic is used by the National Council, as offices for their MPs. And where is the National Council hall? The old conference room adjacent to the banquet hall accommodates this important house of our Parliament. It’s small, congested, uncomfortable, and the Honourable MPs have to undertake difficult maneuvers to enter or leave the Hall when the Council is sitting. Plus there’s hardly any room for visitors. All in all, very, very different from the splendour of the National Assembly Hall. Naturally this is unacceptable. So there’s already talk about building a completely new structure, one that’ll be more becoming for the important institution that is the National Council. Such talk should not be acceptable. About Nu 120 million was spent to build the Royal Banquet Hall. That’s already a lot of money. So rather than spending even more money building a separate National Council – and diverting that money from the people – we should use this building for its intended purpose: as the National Council. The hall is large enough for the National Council, and, with a few improvements, will be as grand as the National Assembly’s. And where should be host government banquets? In restaurants, naturally. 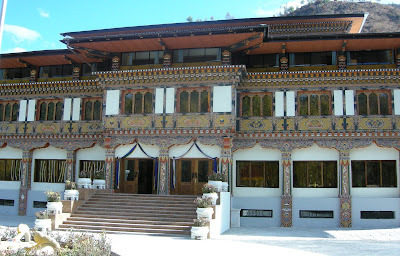 Thimphu already has a few hotels with good banqueting facilities. Many more are already being built. Private entrepreneurs have invested good money building these facilities – it’s time to make better use of them.